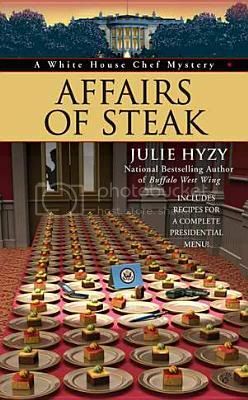 This is the fifth book in the White House Chef series. I have previously reviewed the first four books: State of the Onion, Hail to the Chef, Eggsecutive Orders, and Buffalo West Wing. Having to scope out party locations with White House Sensitivity Director Peter Everett Sargeant doesn’t rank particularly high on Olivia’s list of best ways to spend a day. Actually, it is more likely to fit in as one of her personal circles of hell. Sargeant has, after all, had it in for Olivia ever since he began work at the White House. Olivia’s bad day only gets worse when she and Sargeant arrive at the First Lady’s preferred location for the party and find two fellow White House staffers already there – dead. Not only is Olivia back in the middle of another White House mystery, this time she’s stuck investigating with Peter Everett Sargeant. Another fun book from Julie Hyzy! I didn’t enjoy this one quite as much as Eggsecutive Orders and Buffalo West Wing, but that seems to have more to do with the fact that I read those three in quick succession and just needed to space them out a bit more. I love that Hyzy is continuing to keep this series fresh by changing up how and where Olivia investigates the various crimes that come across her path. Teaming up with Sargeant is certainly not a plot point I ever imagined seeing. Okay, everyone, I’ve spent the last year recommending Julie Hyzy, and this series in particular, to you. If you haven’t read it yet, why not? At the opening of Birds of a Feather, Maisie is becoming pretty well established in her business. She has even been contacted by Joseph Waite, one of the richest men in England and a one-time client of her mentor, Maurice. Waite’s daughter has gone missing – again – and as Maisie begins to investigate, she discovers that there may be a connection to a series of dead women. Birds of a Feather is precisely the book I was hoping for after Maisie Dobbs. In this second book in the series, Maisie truly comes into her own, and the reader is finally able to address her on her own terms, instead of dwelling extensively on her past through the copious backstory that comprised Maisie Dobbs. Here the reader gets to follow Maisie through a full and well-developed case. She has a great process and watching her work a case is fascinating. I also appreciated that Maisie continued to develop as a character in Birds of a Feather. Since the action rested primarily in the present, Maisie was able to indulge in some introspection without losing the reader. Based on my experience with the first two books, I think I would classify the Maisie Dobbs series as smart cozies. Not that other cozies aren’t smart, but there is an extra intelligence and class to Maisie Dobbs that makes the series particularly enjoyable. The great development of story and character, along with the somewhat more genteel inter-war time period make this a series that is suitable for and could appeal to a wide range of readers.